The Field, the newest breed, which came into its own as we know it today in the 1920s and 1930s with Black Prince, has an exciting future and already has a dedicated following. He is an honest and hard working breed, not cursed with an excessive or showy coat or flashy colouring. His success in the showring will flow into other areas in time. FIELD SPANIEL Kennel Club, London 1994. Amended May 1996. The Field Spaniel is a very underrated breed, and could almost be suited to any vocation. They are extremely loyal, bond well and are very soft by nature. 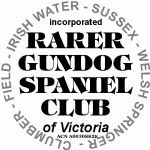 They are successful at working (Flushing game for the shooter) and are said to have the best scenting abilities of all spaniels. I know that this is arguable, but how do you know if you are not prepared to try one? My father rang my doorbell one day; there he stood 4 rabbits hanging from one hand, the other holding his double barrel shotgun. "Should have taken that Field out when he was a baby", he said. "Moved the whole blackberry heap and pushed these 4 out, never even noticed the gun going off, he just kept on working". Kind words coming from someone who was a Lab man through and through. They are both now happily hunting in heaven. There are, among their ranks, agility titles, obedience titles, pets as therapy dogs and even a hearing dog for the deaf. I was fortunate enough to have two Fields assessed for Guide dogs. We were highly recommended for pets as therapy dogs, we were just too small (Height) to carry the harness at the correct angle. This breed is in my opinion highly intelligent and needs to have " Boundaries " set for them to reach their full potential. All spaniels are manipulative and Fields are no exception, don't get sucked in by those big brown eyes. Be firm and consistent and the use of food in training is a must with this breed. Retrieving needs to be fostered at a young age, but most are willing retrievers. They love the water and most are avid swimmers. Their keen scenting abilities can be a downfall and they need to be taught to come from day one. Training needs to be well planned as they are easily bored, so only the minimum amount of work each day. They are fantastic with children, but for both the child's protection and the pups/dogs they should be supervised at all times, this would apply to all breeds of dog. As yet I have never had a Field that gets car sick, most just love the car. In fact my husband brought home an old Ute one day, the next thing he is driving around with 5 Fields in the back. I think the Golfers thought we were mad! They are great eaters and need to be well fed to develop properly. They are a relatively healthy breed suffering only from 3 eye disorders and hip dysplasia, please ensure that the parents have current clear eye certificates and that the hip scores are below the breed average of 16. We number about 110 and you will need to be a little bit patient if you want a Field. Georgie Patterson, Silverbirch Field Spaniels. WHEN IS A FIELD A FIELD? I suppose the interbreeding of dogs in bygone days has left a legacy for the Judge, putting the correct characteristics with the right breed. Needless to say this is far more difficult with rarer and lesser known breeds, and the fact that so few are shown and not always together, a picture is rather hard to acquire of what is and is not correct. Knowing the crosses that produced each breed should be paramount; otherwise you will have no idea of what or why some individuals look like another breed to you. The Field Spaniel is a noble upstanding sporting spaniel built for speed and endurance and therefore should not resemble any of those breeds used to keep him in existence. He should not be short in leg and long in body like the many Sussex Spaniel crosses in the establishment of this breed. He should not remind you of a Cocker short in leg and square in body. The last cross with the English Springer left us with Fields that are long in leg with thin or underdeveloped bodies, that leave the dog unbalanced for his size. He is an individual and should look like a Field. He needs to be slightly off square, his body length slightly longer than his leg length. This breed has well developed chest and prosternum, both in depth and width. We require a moderate spring of rib with a strong and level top line, and a strong short loin. Well developed second thighs in conjunction with well let down hocks give great strength to the hindquarters. A cut up to the thighs is totally incorrect for this breed, as are long loins that afford the dog no drive from the hindquarters. His tail should be set on below the level of the back and carried no higher than the back. He requires substantial drive from the hindquarters to move correctly, he is a well developed and heavy dog for his size. He is not a small spaniel being approximately 18" in height and weighing up to 60lbs. I would expect as judges/breeders you would understand that the hardest thing on any breed to achieve is the correct lay of shoulder and length of upper arm. I don't think that as trainee judges a comment like " its short in upper arm" is in anyway constructive to understanding this breed, let alone to judge it. Look at the dog and see what it does have that the breed requires, Yes it could have a better length of upper arm, but it has good bone, nice size, and is balanced. The front is only a part of the overall dog and I see plenty of other breeds winning day in day out that are not exactly correct in the shoulder. The lay of the shoulder needs to be balanced at he other end with the turn of stifle and our standard calls for a moderate turn of stifle. Heads are the hallmark of this breed and to some enthusiasts set them apart. The foreface should be slightly longer than from the stop to occiput, and the occiput should be pronounced. The stop is formed by the pronounced eyebrows and the chiselling beneath the eyes finish the picture. Without this chiselling the head is rather plain. Almond shaped eyes with colouring that matches the coat are correct. Remember that a liver Field's eye colour will darken as it gets older and a black's will lighten. Light eyes are incorrect for this breed, and along with broad skulls and short muzzles, are a throw back to the Sussex in our lines. When judging was done on a point score system the whole head was only 20 points out of a possible 100, so please take this into consideration when judging this breed. I would much rather a dog with a plain head be placed first than one with a long loin going up. I would not penalise a dog with missing or misplaced teeth. You can see that the jaw is correct when you look into a mouth; this is a working breed and in my opinion should not be penalised. He has a long unhurried stride or an effortless gait that gives the appearance of great stamina, straight and true as seen from the front and rear. To judge correct movement the dog needs to be shown on a loose lead. The dog needs to be able to lower its head as it moves into its gait and should not be "strung up" as the dog then cannot move as it would if it was working. To see the reach in the front the head will move out and the front paws will extend and a line could be drawn from the tip of the dogs muzzle to its feet as it moves around the ring. Rear movement should be judged from the dogs pads as it moves rather than watching their legs. Fields are very slow maturers and the hindquarters may take time to tighten up. This does not mean that a dog should have cow hocks or move closely behind. They must be wide and square when viewed from behind, and it is near impossible to have a dog with the correct turn of stifle, thick well muscled loin, and well let down hocks to be close behind. This breed needs to be in good hard working condition, he is after all a Gundog. Colour is something that fools lots of judges and it is very easy to say, "Picture the dog as one colour". Fields come in liver, black, roan, any of these with tan markings. Clear Liver and white or Black and white are unacceptable. The standard was recently altered to allow for white or roan on the front. This has always been allowed, but was not written in the standard. Our lines could produce any of these colours, so who knows what we may get. There is nothing like the presence given when a well put together and superbly headed Field enters the ring, he is truly a majestic dog. When judging this lovely breed please give consideration to the few breeders who have brought this dog into the 21st Century. It is a difficult breed with a small gene pool, but it has some excellent representations of the breed here in Australia and they deserve that acknowledgment in the Show rings here as well.